Everyone has been to an arcade. Pretty much everyone has also wasted countless quarters on the game where you put a quarter in hole hoping that it will knock other quarters off the shelf. You soon find yourself down $20 and 300 tickets in your hand that just might buy you a stuffed animal. Don’t waste another quarter! You can buy your very own coin pusher machine! Your coin pusher won’t be the same size as the arcade version, but it does exactly the same thing, except the part about taking your money and never giving it back. The coin pusher has LEDs built right into the machine and it even plays music. You’ll actually feel like you’re at the arcade. The best part is the built in alarm system, if you try to shake or push the machine to get a few extra quarters, a siren will sound and the game will freeze up. 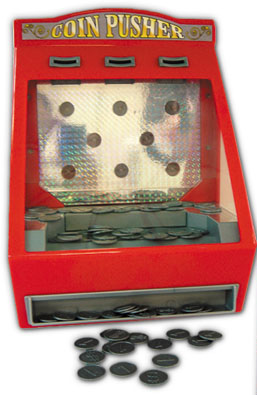 For playing the actual game, there are two options, using the included plastic coins, or your own quarters. Of course, using the plastic coins is silly, it’s not nearly as much fun as using your hard earned quarters. Besides, getting plastic coins when you win would be pretty disappointing, wouldn’t it? Never again will you feel compelled to put a quarter in one of those coin pusher games when you pass the arcade. Get your alarm-equipped miniature coin pusher from Stupid.com for $30. It’ll pay for itself once you pass two arcades, which shouldn’t take long.